Next year will be a VSB for me- a Very Significant Birthday. Now I know, I know… it’s only a number; you’re only as old as you feel blah, blah, blah; you don’t look a day over thirty (I’m sure somebody said that…), but let’s be honest, it’s a Very Significant number. 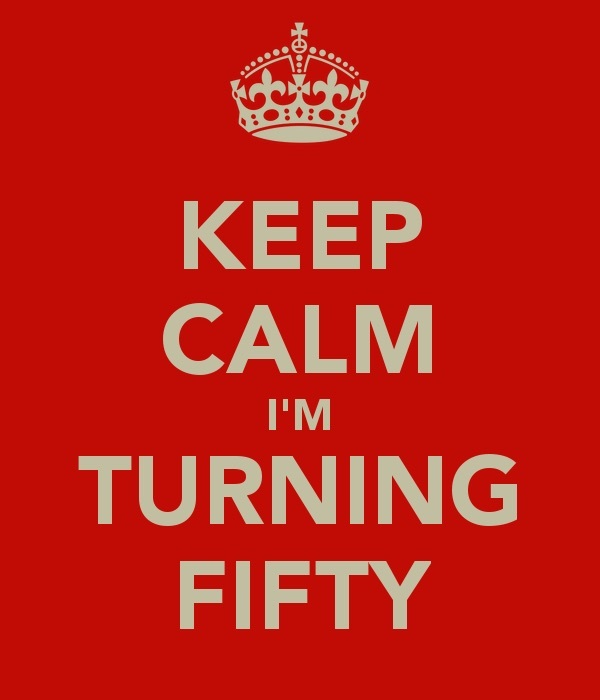 I mean, it’s half a century, that’s got to count for something, right? If I drank fifty bottles of wine or ate fifty bars of chocolate people would sit up and stare. Admittedly because I’d resemble a paralytic hippopotamus, but that’s besides the point. It’s a BIG number, and that’s that. So, what’s a girl to do? Obviously it’s got to be something significant because I’m only doing this once. After next year all birthdays will be cancelled – in number only you understand, I shall still expect cards and gifts. I’ve considered all sorts of things: from extravagant holidays to lavish parties; from balloon rides to bungee jumping; from running a marathon to cycling across Africa with a group of equally bonkers ladies. But I’ve decided I want to do the two things I love best (apart from cooking)- cycle and spend time with Alpha Male. So the decision has been made: we’re going to cycle down France from La Manche to La Mediteranėe. 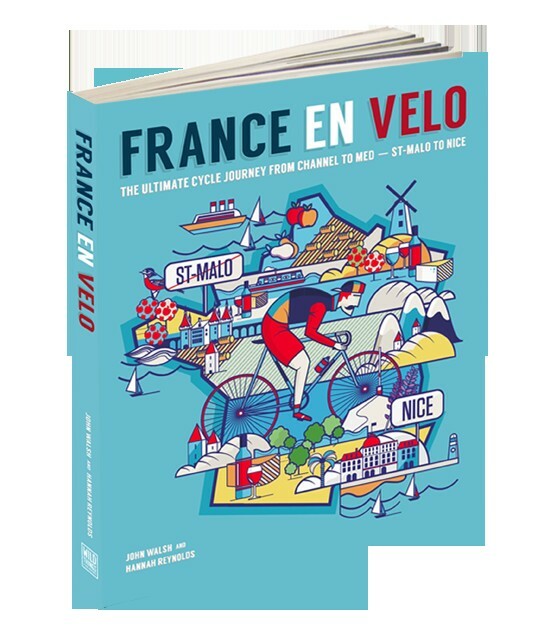 The inspiration for this trip was a book that Santa brought last christmas, entitled France en Velo, which for those of you who don’t speak French, translates to France on a Bike. And so Operation VSB has commenced. When I originally mentioned a certain bag as a birthday gift, I was actually referring to one of the Mulberry variety; now we are talking bike panniers instead. My thoughts of swanning into a swanky local establishment, resplendent in sequinned frock and stiletto sandals have turned more to thoughts of shorts with padded gussets and a good sturdy pair of cycling shoes. A coordinated set of Gucci luggage, complete with matching vanity bag, has been eschewed in favour of a bag the size of the average plastic carrier, with a tube of SPF50 and some chamois cream (if you have to ask about that, DON’T. Just google it. It’s a cycling thing that nobody talks about in polite society). ‘Are you quite mad?’ I hear you ask. Quite possibly. 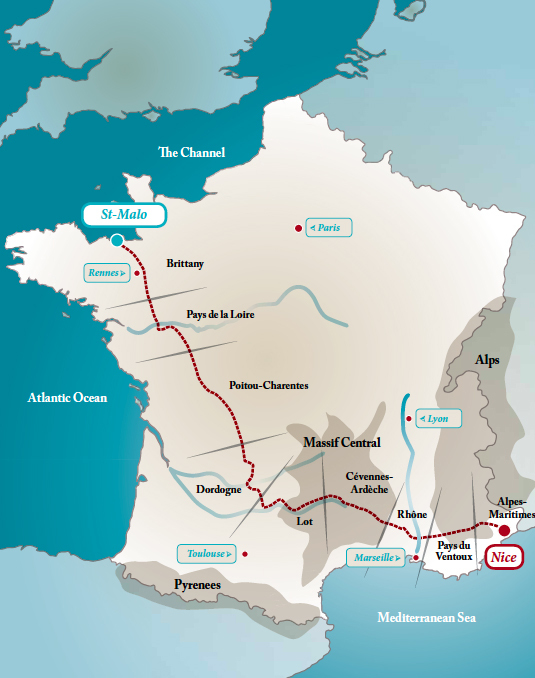 It’s a journey of some 1000 miles across 19 of France’s regional Departements. It will encompass beaches, rivers and rolling hills. And mountains – oh how I’m looking forward to those….But it will all be taken at a steady pace, quite unlike our Sunday bike rides here that leave me unable to move until Tuesday. We’re planning to take three weeks to complete it, and yes, I am expecting a 5 star hotel in Nice for at least four nights at the end of it. The days will involve morning coffee at roadside cafes with at least five croissants; long lazy lunches grazing our way through baguettes and Brie, washed down with cheap local plonk; and each day will culminate in a different bed in a different village with the biggest, most calorific dinner I can find. AlphaMale did raise the ugly subject of camping at one point in our discussions, but that very foolish idea has been well and truly shelved. I have explained that I am envisaging a hot bath, sprung mattress and a ceiling fan at the very least each night, complete with a door that closes, as opposed to a zip that zips. Rest assured, there will be no camping. But still there are questions to be answered. Will I make it? I hope so, it’s a long walk home. Will AlphaMale & I still be speaking at the end of it? I expect so – I generally talk and he pretends to listen, so apart from the mountainous regions (where oxygen may be diverted to assist breathing), normal service should continue. Woooo check you out!!! That’s a long way to cycle – but you’re my kinda girl stopping off at BnB’s each night and finishing it all off with a swanky stay off at a plush hotel in Nice at the end of it – you go girl. Fancy some extra company? Am sharing a VSB with you too next year and this sounds just up my street. Not sure if OH would be game (mainly due to the ‘work beckons’ excuse), but love the idea… and yes, three’s a crowd. Might have to gather up some cycling lady friends of my own to come along and keep me company. And hello, btw – cannot believe I have only just found you, despite the Welsh connection (or maybe perhaps of it)! Thank god I’m not alone in the VSB situation! Sadly the cycling trip is a closed shop for the two of us to enjoy together. I’m looking for a link to an organised ladies cycling trip in France that I saw recently. I’ll send it to you when I find it.